This piece is one of the best you can find, a typical Karner piece in all its glory. Again, multi-piece construction would be prohibitive and require skilled artisans to bring this piece to the end of the production line. 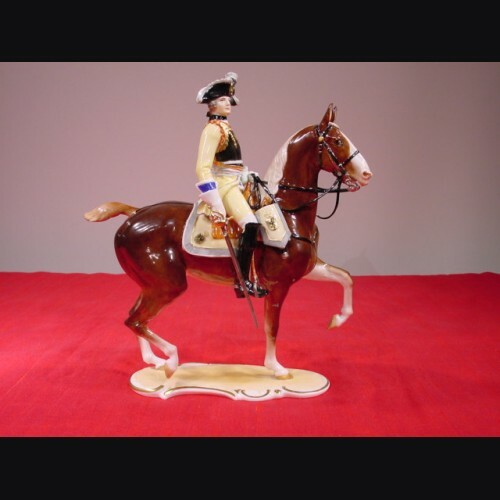 This piece enjoyed good success based on the amounts produced for an equestrian figure. Production for this piece went into wartime which is notable from the use of yellow paints found on the figure in colored configuration. Precious metals were prohibited from use at the start of the war in 1939 and the use of gold leaf ceased. The piece pictured is considered a pre-war piece with gold leaf accents.